You are currently browsing the category archive for the ‘Exhibitions’ category. California Current, colored pencil by Nina Antze, © 2018. Learn about the non-native invasive plants at the Madrona Marsh Preserve in Torrance, California. Participants will tour the nature preserve and select an invasive plant to use as their specimen. Participants can remove as many specimens from the preserve as they would like! Additionally, BAGSC members are invited to submit works for the exhibition “Non-Native Invasive Plants of the Madrona Marsh” to be held in the summer of 2019, opening June 1 and running until August. Nina’s workshop is a great opportunity to get your artwork started for submission to this important exhibition. Questions about the exhibition? Contact Olga Ryabtsova, BAGSC Exhibition Chair. To see more details and to register for Nina’s workshop: go to BAGSC’s website at https://bagsc.org/ click on “Classes” and then on “Class details” under the workshop name, OR go directly to https://bagsc.org/index.php/classes/nina-antze-2019. Celebrating Silver-The ASBA Turns 25! 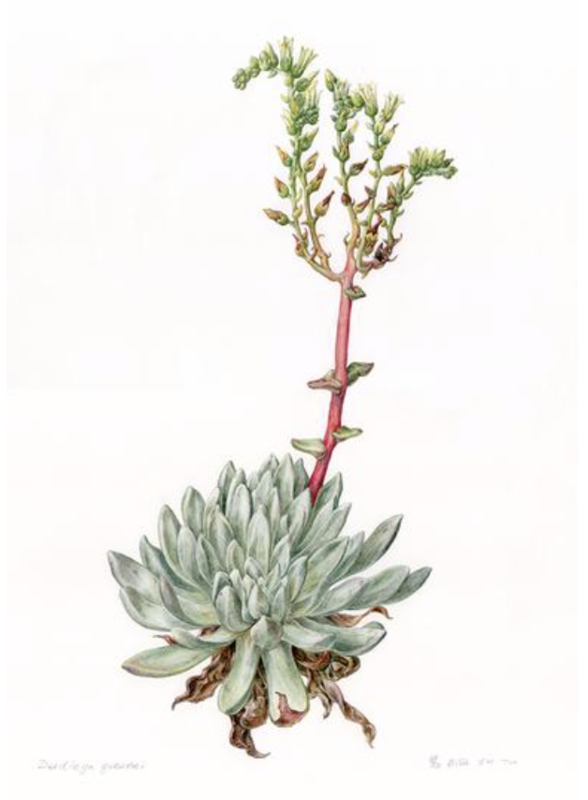 Dudleya greenei, Greene’s Live-Forever, Watercolor on paper by Ellie Yun-Hui Tu, © 2015. This year ASBA celebrates its 25th Anniversary! Founded 1994, with 200 original members, it has grown to the vibrant organization of over 1700 botanical artists from around the world. As part of the celebration a special ASBA 25th Anniversary art catalog, “Celebrating Silver,” will be published. Each ASBA member in good standing is eligible to submit a scanned image of an artwork on the ‘silver’ theme. You may use the media of your choice, including Silverpoint, but all subjects must be of a plant with silver in its scientific or common name, or have a silvery appearance. Examples are Silver Birch (name) and Dusty Miller (appearance). For further information, see the Call for Entries page on the ASBA website. The catalog will not be juried. Submission deadline is June 10, 2019. The catalog is to be published October, 2019. In addition to the Catalog each of the Chapters and Circles have been asked to plan an event as part of a rolling series of celebrations held across the country on the theme of “Celebrating Silver.” BAGSC members are encouraged to submit a scan to be included in the catalog. Plans are in the works for a BAGSC art show of “Celebrating Silver.” Stay tuned! 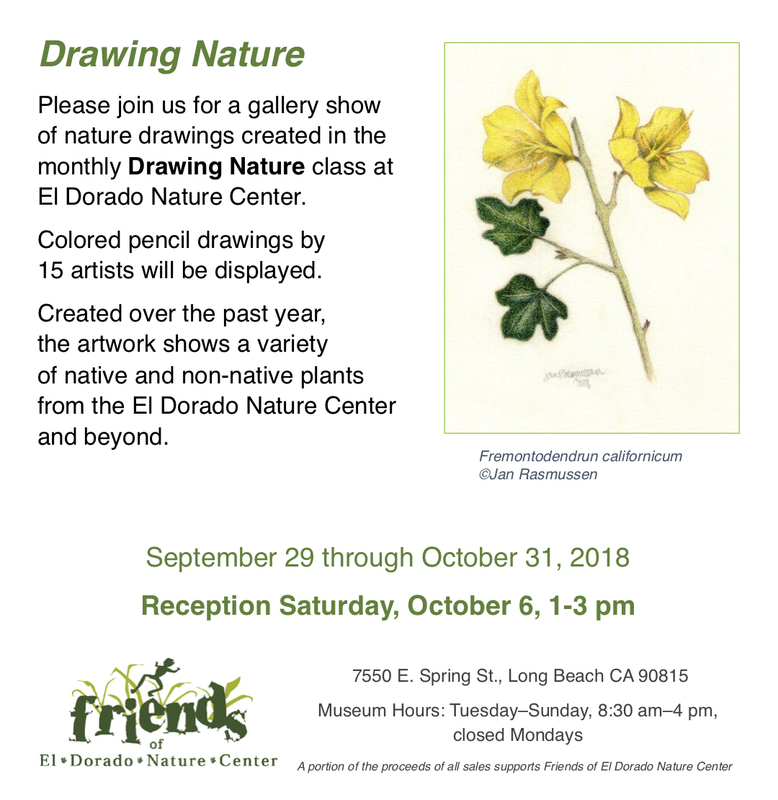 Flyer for “Drawing Nature” exhibition in Long Beach, California. “Drawing Nature,” an exhibition of artwork created in Nina Antze’s colored pencil classes at the El Dorado Nature Center will close on October 31, 2018. 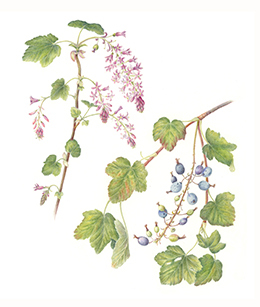 Come see colored pencil drawings by 15 artists of native and non-native plants. The exhibition can be seen at 7550 E. Spring Street, Long Beach, California 90815. The Museum hours are Tuesday–Sunday, 8:30 am–4pm. Vehicle parking fees range from $5–$8, depending on the day; directions and general information can be found here. A portion of the sales proceeds supports the Friends of El Dorado Nature Center. Midnight (Eastern Daylight Time), August 31, 2018 is the last day to register for the American Society of Botanical Artists 24th Annual Meeting & Conference in St. Louis!! Come spend time with fellow botanical artists, take workshops, and attend lectures. 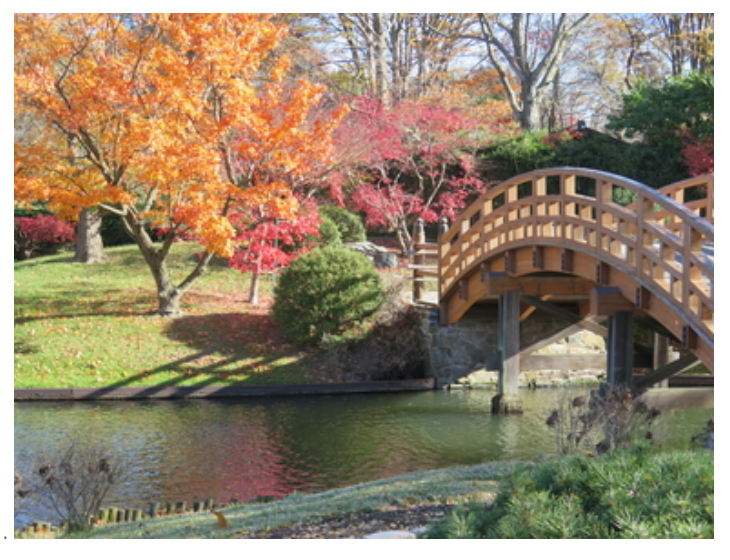 Spend quality time at the Missouri Botanical Garden, one of the world’s top botanical gardens. 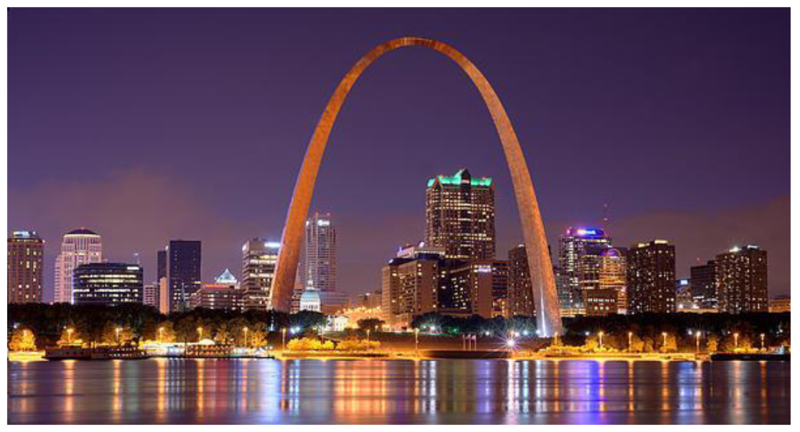 Founded in 1859, the Missouri Botanical Garden is the nation’s oldest continuously-operating botanical garden and a National Historic Landmark. The Foundry Art Centre in St. Charles, Missouri will host “Out of the Woods: Celebrating Trees in Public Gardens, the Third New York Botanical Garden Triennial” exhibition of botanical art along with a companion, adjunct exhibition “Out on a Limb.” A reception for conference attendees will be held Thursday, October 11, and will also feature the slideshow of artwork from the 25-country Botanical Art Worldwide exhibitions. To register, look at the descriptions and information on the ASBA website. Then go to the Conference Registration website to register. Scroll down on the registration site to see openings remaining in various workshops and presentations. There are a lot of openings left in wonderful workshops! If you’ve already registered but would like to add a class, contact the conference registrar to request the additions to your registration. Signage with artwork by Esmée Winkel, Leiden’s 300-Year-Old Tulip Tree in Autumn (2016), Liriodendron tulipifera. Hortus Botanicus Leiden, Leiden, The Netherlands. Watercolor on paper. © Esmée Winkel. 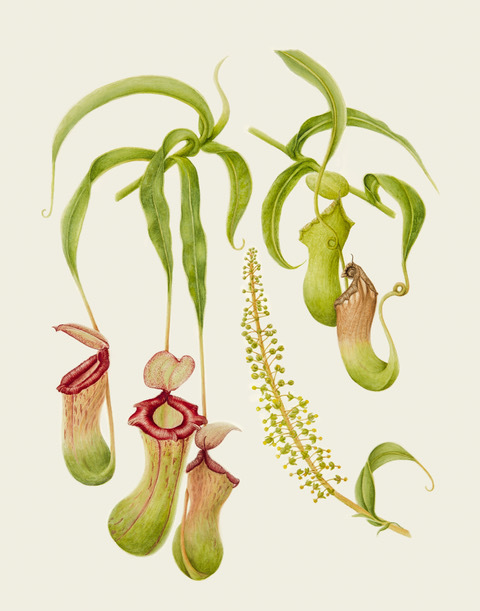 Courtesy of the American Society of Botanical Artists and the New York Botanical Garden. 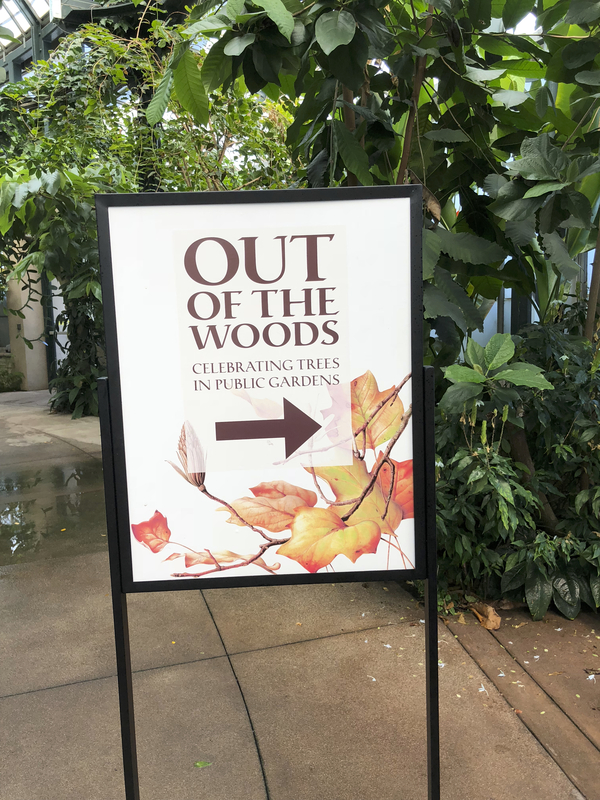 Make it a day at The Huntington: see “Out of the Woods,” organized by The New York Botanical Garden and the American Society of Botanical Artists, and “Amazing Trees,” the adjunct exhibition by BAGSC members in the Brody Botanical Center, Flora Legium Gallery. Then pop next door to the Rose Hills Foundation Conservatory for Botanical Science to see the blooming Corpse Flowers! The exhibition closes Monday, August 27, 2018. The traveling exhibition will then go to the Foundry Art Centre in St. Charles, MO where it will be on display October 5 – December 28, 2018, including during the American Society of Botanical Artists annual meeting and conference. In the beginning of next year, the exhibit will travel to the Tucson Botanical Gardens, Tucson, AZ, January 25 – April 13, 2019, and then on to the Minnesota Landscape Arboretum, Chaska, MN, May 9 – August 13, 2019. 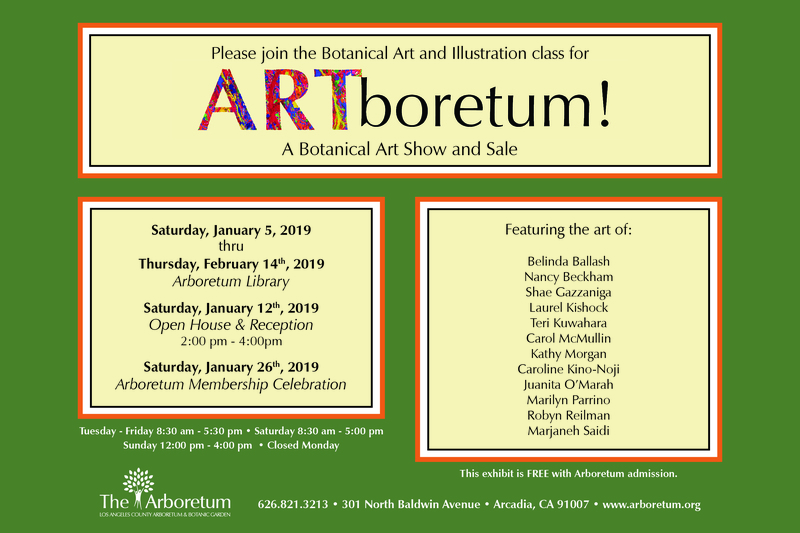 The wonderful botanical art exhibitions at The Huntington Library, Art Collections, and Botanical Gardens Brody Botanical Center are in their final month of display. 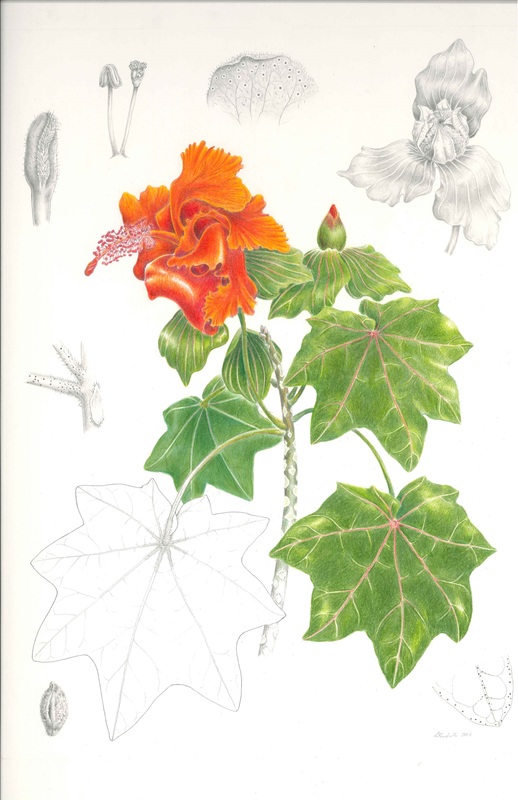 Out of the Woods: Celebrating Trees in Public Gardens, The Third New York Botanical Garden Triennial and American Society of Botanical Artists will be on display until August 27, 2018, along with BAGSC’s adjunct exhibition “Amazing Trees.” BAGSC members will continue to have drop-in family botanical art activities and botanical art demonstrations every Saturday and Sunday through that time as well. Linda Chiavaroli, a volunteer author in the office of communications and marketing at The Huntington introduced the exhibition with an article in “Verso,” The Blog for The Huntington Library, Art Collections, and Botanical Gardens. Read the article here. Deborah Friedman was interviewed and videotaped by Aric Allen, Video Producer, The Huntington Library, Art Collections, and Botanical Gardens about her development of her painting of the California Sycamore, Platanus racemosa in “Out of the Woods.” See the insightful video interview on YouTube here. Click on any of the images below to see in slide show with captions. Some of the signage for The Huntington’s Fellows reception and open house, with Esmée Winkel’s Leiden’s 300-year-old Liriodendron tulipifera in Autumn Liriodendron tulipifera Hortus Botanicus, Leiden, The Netherlands. Phaleonopsis from The Huntington’s collections in luxurious display. The open house/reception flowed from the demonstrations in the Ahmanson through the courtyard into the Brody Botanical Center. L to R: Jim Folsom with BAGSC members Jude Wiesenfeld, Teri Kuwahara, Beth Stone. Guests enjoying the “Out of the Woods” exhibition. Mitsuko Schultz, with her artwork in “Out of the Woods,” Sweet Gum Liquidambar styraciflua ‘Burgundy’ Los Angeles County Arboretum and Botanic Garden, Arcadia, California. Jim Folsom, always on the move. The open house included displays with microscopes for guests to view specimens, as well as tours of the Herbarium, labs, and other research and library spaces in the Brody. Signage for the BAGSC artists who demonstrated botanical art during the evening. BAGSC members setting up for the botanical art demonstrations. L to R (seated): Estelle DeRidder, Jude Wiesenfeld, Olga Ryabstova; (standing) Teri Kuwahara. 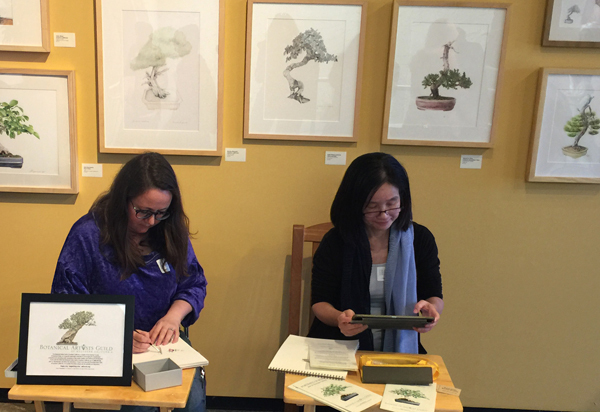 BAGSC members (L to R) Veronica Raymond and Suz Landay, demonstrating botanical art. 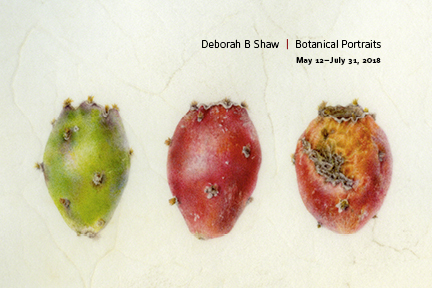 BAGSC member Deborah Shaw demonstrating botanical art. Jude Wiesenfeld demonstrating botanical art. Guests viewing the botanical art demonstrations, with images from the ASBA Worldwide exhibition in the background. 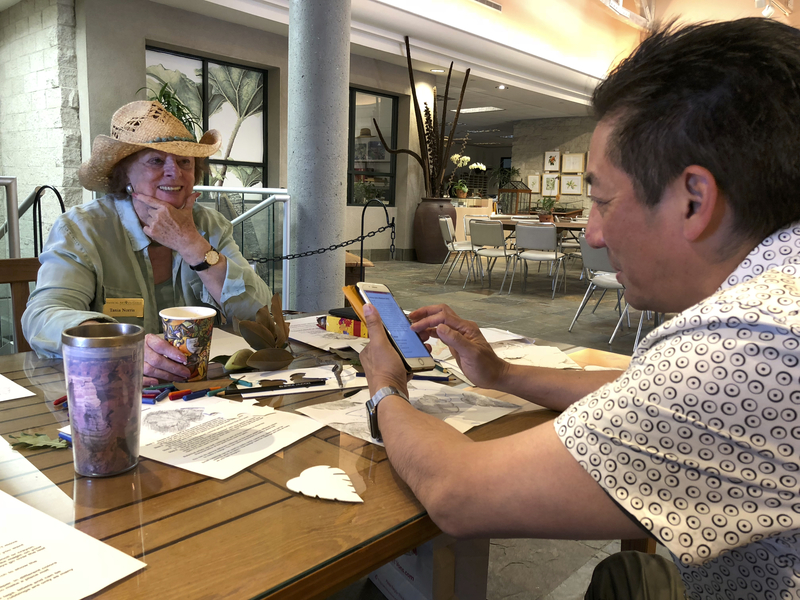 The calm before the crowds: (L) BAGSC member Tania Norris and Robert Hori ready the tables for the drop-in family botanical art activities. BAGSC members have provided drop-in family botanical art activities every weekend throughout the summer, including leaf-rubbings; botanical art demonstrations; a segment in cooperation with The Huntington’s education department for their “avocado day,” and lots more! Additionally, BAGSC members have been on hand to answer questions from the public about botanical art and artworks in the exhibitions. It has been wonderful (and inspiring) to find many visitors to the exhibitions who have not only returned to see them multiple times, but have brought others to see them as well. In early June, BAGSC members had the good fortune to be able to have Carol Woodin, ASBA Exhibition Chair at our quarterly meeting. Carol was in Southern California presenting at the American Public Gardens Association Conference with Devin Dotson from the US Botanic Gardens. Carol spoke to BAGSC members about painting orchids, followed by an audience-requested tour through the “Out of the Woods” exhibition. Click on any of the images below to see an enlarged slide show of the images with captions. BAGSC members and guests at the meeting. Carol Woodin reviewing her notes before her presentation about orchids. Carol discussed what she looked for in an orchid subject, as well as composition issues that orchids may present. BAGSC Treasurer Beth Stone giving her report. Jim Folsom documenting the meeting. “Out of the Woods” didactic inside the exhibition. Carol graciously gave an impromptu tour of the “Out of the Woods” exhibition. BAGSC members and guests attending the meeting had time to spend with the artworks. Carol Woodin talking about the artwork in the “Out of the Woods” exhibition. Mitsuko Schultz spoke about her artwork, Sweet Gum Liquidambar styraciflua ‘Burgundy’ Los Angeles County Arboretum and Botanic Garden, Arcadia, California. 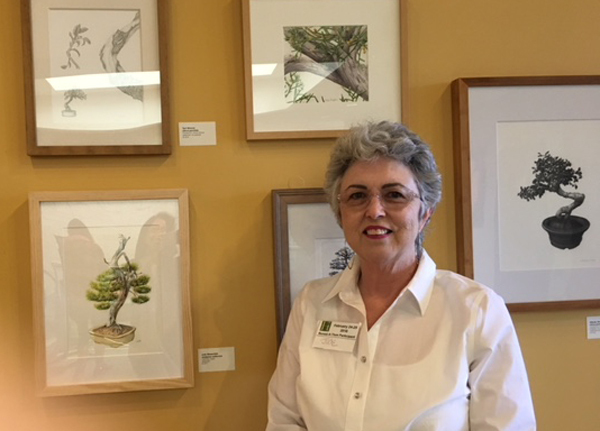 Olga Ryabstova spoke about the print-making process, as well as her piece in “Out of the Woods,” Roxburgh Fig Ficus auriculata San Diego Botanic Garden, Encinitas, California. On Sunday, July 29, 2018, The Huntington hosted a stellar reception for the exhibitions for around 70 BAGSC members, family, friends and guests. Click on any of the images below to see a slideshow and read the captions. A few words from Jim Folsom. L to R: BAGSC members Bonnie Born Ash and Tania Norris. “Amazing Trees” is placed throughout the Brody atrium walls in a delightful display. Lee and Chuck McAffree came down from Northern California. Esmee van Winkel’s painting of Leiden’s 300-Year-Old Tulip Tree in Autumn, Liriodendron tulipifera, Hortus Botanicus Leiden, Leiden, The Netherlands has graced all the signage, large and small, and the printed marketing materials produced by The Huntington. The signage is everywhere throughout the campus. Click on any of the images below for a small sampling, and to read the captions. Signage at the front entrance of The Huntington Library, Art Collections, and Botanical Gardens. Digital signage in the front entrance courtyard area. Digital signage above the ticket booths at the front entrance. Table-top advertisements in the Café. Graphic just outside the Flora-Legium gallery where “Out of the Woods” is on display. One of many free-standing signs in the Conservatory. “Out of Woods” catalogs on display in The Huntington Store, along with a selection of notecards by BAGSC members in the “Out of the Woods” exhibition. Five of the six cards are shown here; The Huntington Store sometimes has them all together, other times they are grouped with like subject areas in the store. “Out of the Woods” exhibition catalogs are on sale in The Huntington Store for $12.00 US. 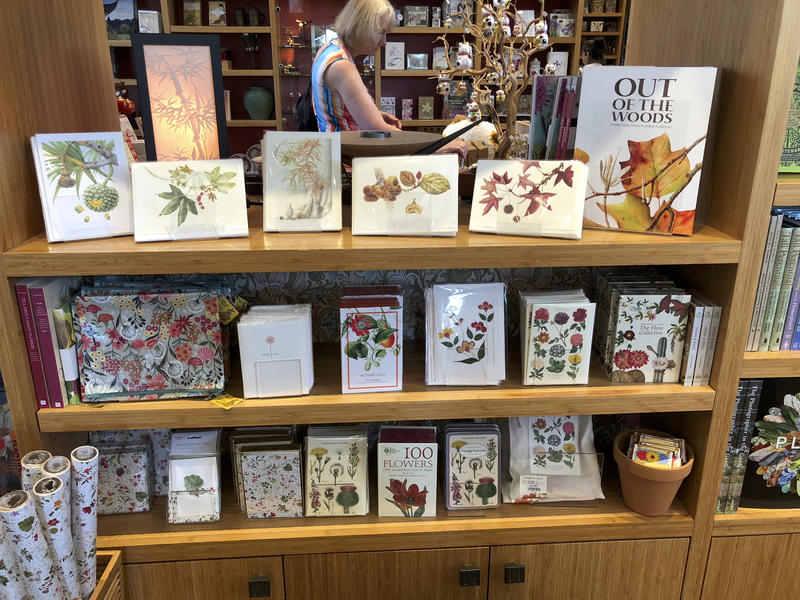 The Store also is carrying a limited edition of notecards with artwork by BAGSC members in the “Out of the Woods” exhibition, including Margaret Best (Screw-Pine, Pandanus utilis, Bermuda Arboretum, Bermuda), Akiko Enokido (Swamp Cypress, Taxodium distichum, Kobe Municipal Arboretum, Kobe, Japan), Deborah Friedman (California Sycamore, Platanus racemosa, detail from original, The Huntington Library, Art Collections, and Botanical Gardens, San Marino, California), Asuka Hishiki (Black Pine Half-cascade Style Bonsai, Pinus nigra, The Omiya Bonsai Art Museum, Saitama, Japan), Olga Ryabstova (Roxburgh Fig, Ficus auriculata, The San Diego Botanic Garden, Encinitas, California), and Mitsuko Schultz (Sweet Gum, Liquidambar styraciflua, ‘Burgundy’, Los Angeles County Arboretum and Botanic Garden, Arcadia, California). 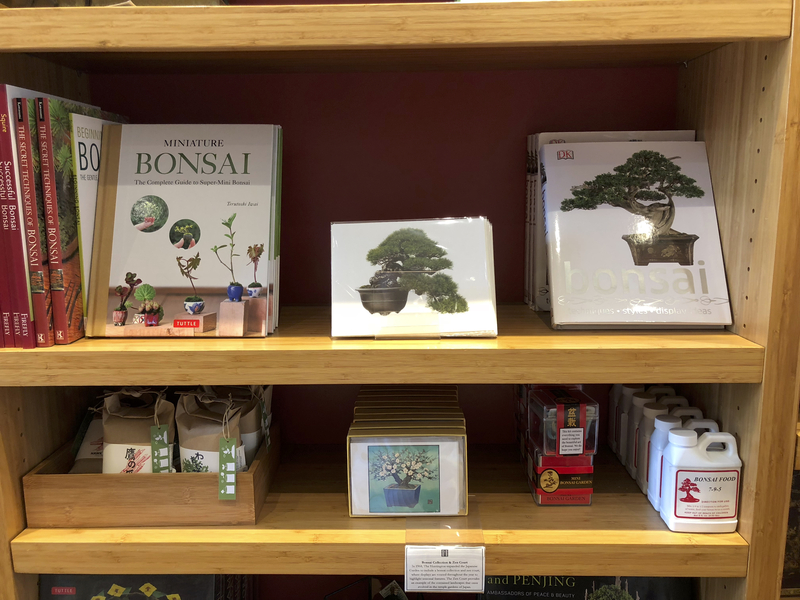 Asuka Hishiki’s notecard in The Huntington Store on display in the Bonsai area of the Store. A heartfelt thank you is due to too many to list here, but a special thank you to The Huntington’s Jim Folsom, Robert Hori, Danielle Rudeen, Melanie Thorpe and Andrew Mitchell, along with The Huntington’s Exhibition, Communications, Video, Education, Store and Graphics departments. Another special thank you to the BAGSC artists in “Out of the Woods,” who generously supported our test into The Huntington Store, and to all the other members who worked to make these exhibitions a success. And, last but not least, a heartfelt thank you to Tania Norris for all her work on the exhibition and coordinating the weekend botanical art activities. 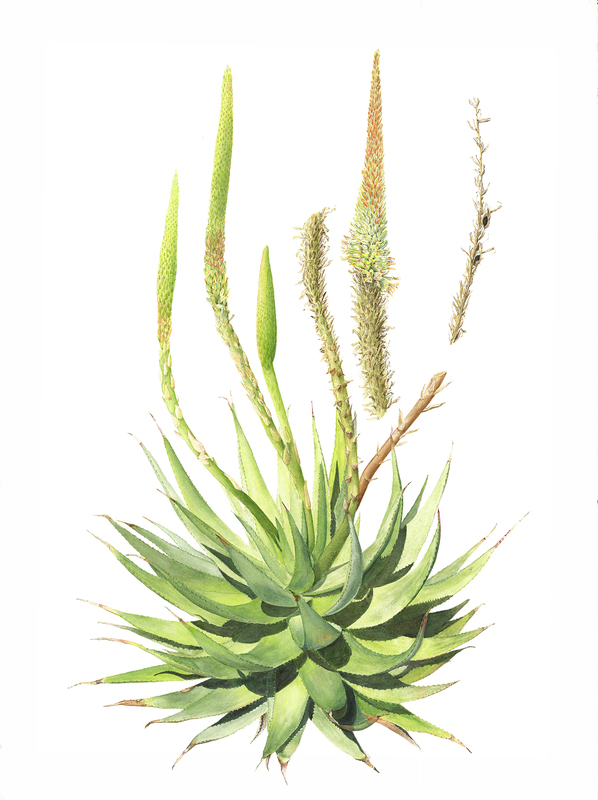 Aloe broomii hybrid, Melanie Campbell-Carter, watercolor on paper, © 2018. Image protected by Digimarc. BAGSC member Melanie Campbell-Carter is returning to Texas wearing her Botanical Artist hat! As fellow members know, in 2014 Melanie relocated to Southern California from Texas to study botanical art. Melanie was thrilled to see an article in the March 2018 issue of The Botanical Artist about a new ASBA Circle in north Texas. The Circle’s first juried exhibition, Botanical Art: Flowers, Fruit and Fungi, will take place June 14 – August 9, 2018, at the Botanical Research Institute of Texas (BRIT) in Fort Worth. Now living and painting full-time in Tucson, Melanie will be exhibiting two new paintings in Fort Worth, Aloe broomii hybrid and Caesalpinia pulcherrima. 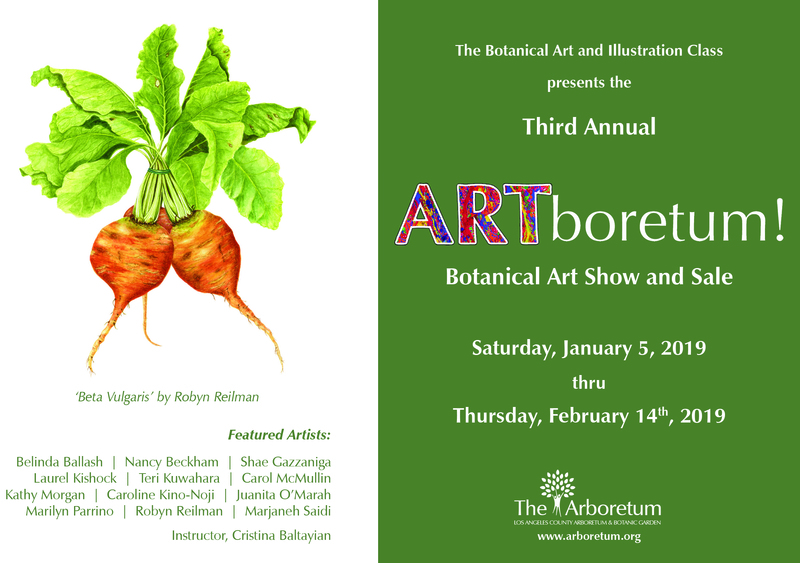 Contact Denis Benjamin for more information about the Botanical Art Collective (BAC) in Texas, or if you would like to join. BAC also has a public Facebook page: https://www.facebook.com/groups/1502598476445397/. 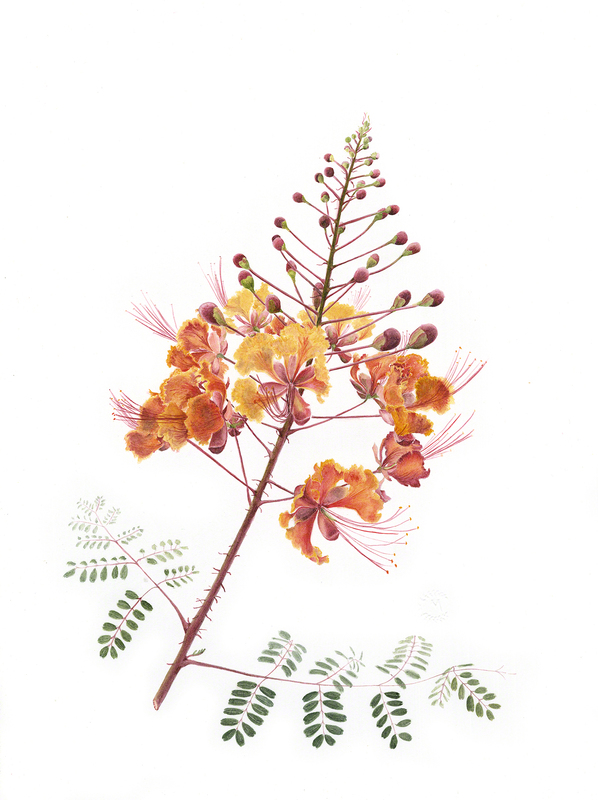 Caesalpinia pulcherrima, Melanie Campbell-Carter, watercolor on paper, © 2018. Image protected by Digimarc. Are you are entering a BAGSC exhibition? This is how you should deliver your art! 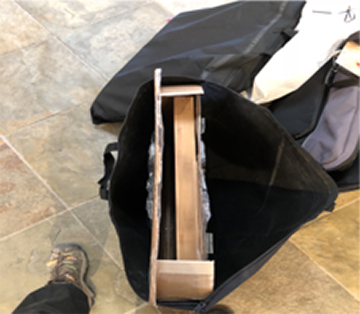 Please be aware that when you deliver artwork to a local BAGSC exhibition, the BAGSC members who are hanging the exhibition will be collecting everything together and transporting artwork to the exhibition location. This is usually done by one or two people who will be carrying the art into the location. Mitsuko Schultz’s packing box showing the interior box and artwork. Photo by Janice Sharp, © 2018. To do this efficiently—and safely for the artwork—it is best to have all the art in portfolios with good carrying handles, clearly labeled with the artist’s name and contact information. Facilities where we hang art often do not have convenient places to pack and unpack art. Therefore, delivery in a portfolio allows the art to be simply slipped out of the portfolio or slipped back in. Art in the portfolio can be protected with Foam-Core or cardboard. Plexiglass is notorious for scratching easily. Foam-Core or cardboard across the front that does not touch the surface of the plexi will help protect it. 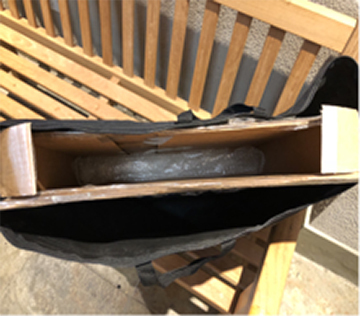 Please see the sample photos of Mitsuko Schultz‘s portfolio to the left which contains an interior box made of cardboard to support and protect the framed artwork. The box is sufficiently wide to accept at least two pieces of art. An additional sheet of cardboard could be used between the frames if two were inserted into the box. This kind of a system makes it extremely easy (and safe) to unpack and repack art. Mitsuko Schultz’s packing portfolio showing the interior box and artwork. Photo by Janice Sharp, © 2018. We ask that all BAGSC members exhibiting use a similar system to make it easy for those who are hanging and taking down exhibitions. Of course it is expected that people mailing art will do so in a suitable mailing container instead of a portfolio! We thank everyone for their attention to these important details. 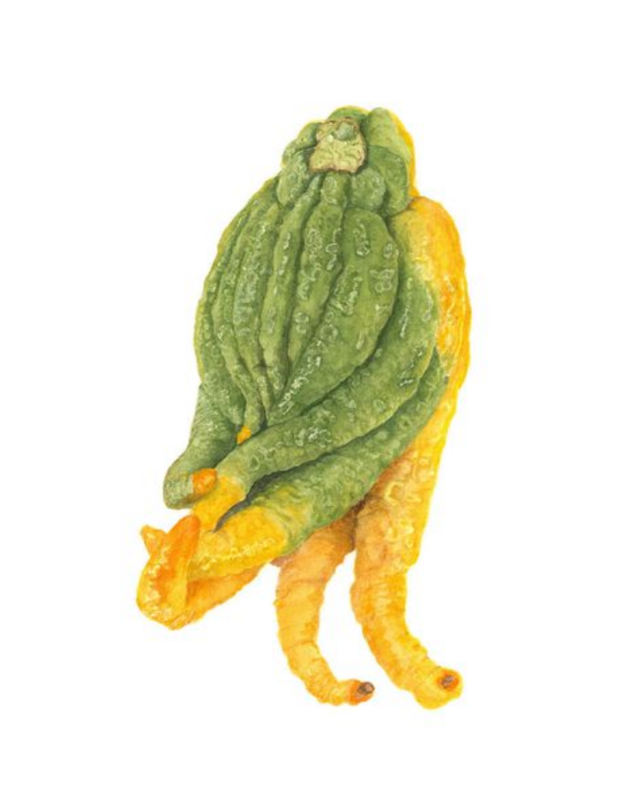 Sally Jacobs’ “Buddha’s Hand (Lemon Fingers) Watercolor,” 19×16. Part of Sally Jacobs’ “Sundays at the Farmers Market” exhibition at the TAG Gallery in Los Angeles. Drawing Class: “How to Draw a Leaf,” Saturday, May 5, 1 – 3:00 pm. Beginners welcome. Class size limited; contact Sally to register. 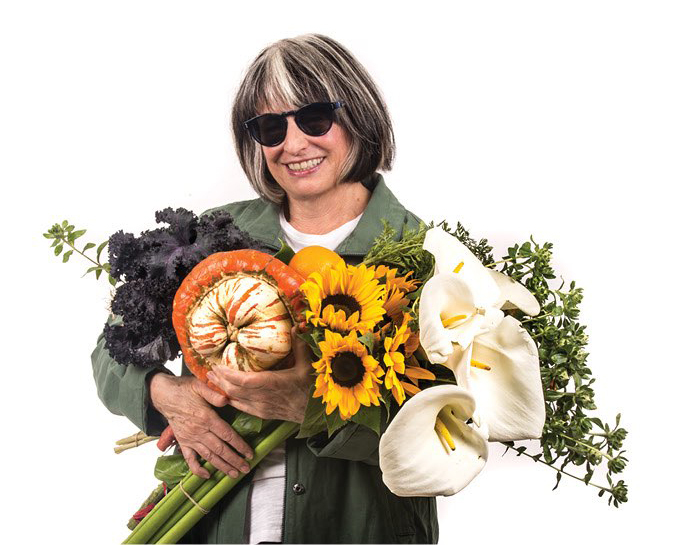 Jeanette Marantos, LA Times wrote an article about Sally’s exhibition for the Home & Garden section, entitled “This L.A. artist grows luscious fruits and veggies — in watercolor”. Read the article and see a slide show of all Sally’s paintings in the show. Sally Jacobs with an armful of inspiration. 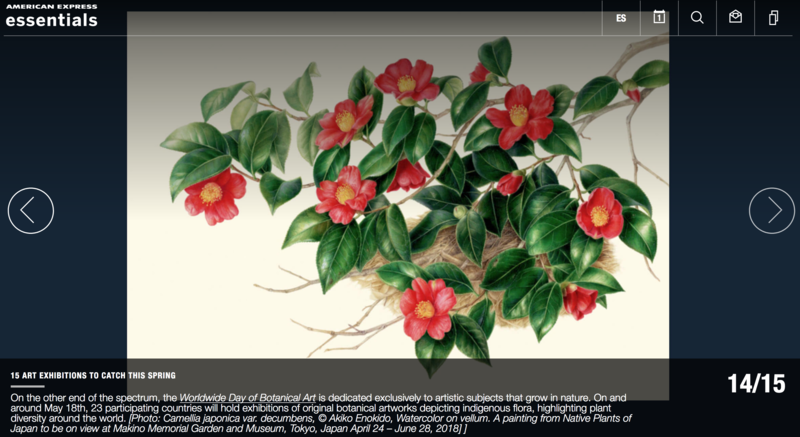 Akiko Enokido and Botanical Art Worldwide Featured as 1 of 15 Exhibitions to See this Spring! Congratulations to Akiko Enokido, her Camellia japonica var. decumbens is included (number 14 of 15 in the slide show). Thank you to the ASBA facebook page for the notification! BAGSC and ASBA member Akiko Enokido’s, Camellia japonica var. decumbens. BAGSC handouts for “Portraits of Bonsai from The Huntington Collection.” Cover image, Ficus retusa, watercolor on paper, © 2018 Anna Suprunenko. Brochure and photo by Olga Ryabtsova, © 2018. 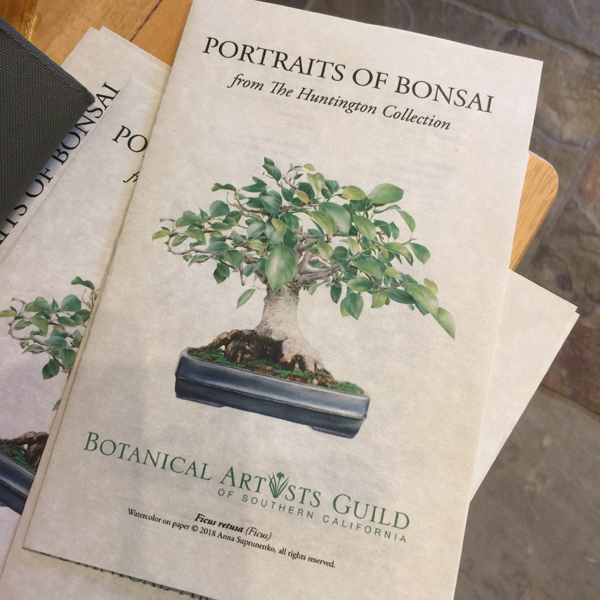 The Botanical Center at The Huntington Library, Art Collections and Botanical Gardens, is the location for the BAGSC exhibition ‘“Portraits of Bonsai from The Huntington Collection.” The paintings received many admiring comments from the public and participants at The Huntington’s Bonsai-a-Thon held the weekend of February 24 – 25, 2018. Demonstrations during the two-day event were given by Olga Ryabtsova, Mitsuko Schultz and Tania Norris. The questions and comments from the viewers were many and varied. They ranged from ‘how do you?’, ‘I could never do that’, ‘are they for sale?’ and ‘where do I find classes?’ etc. People were really interested and appreciative of our participation. Amazing Bonsais everywhere! Photo by Olga Ryabtsova, © 2018. 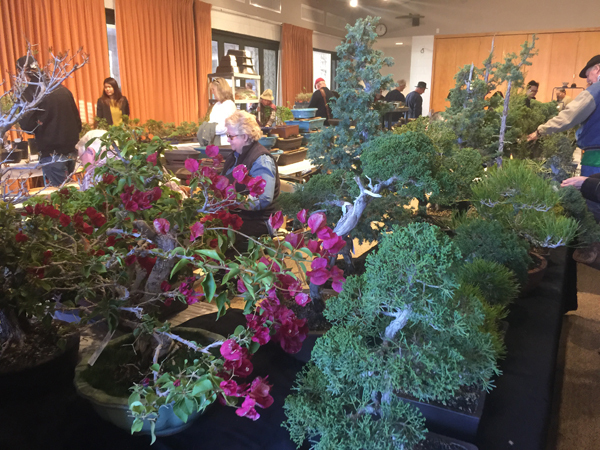 The wonderful and patient Bonsai master, Ted Matson, gave a long plug for BAGSC before he started the auction of bonsai for the attendees. He mentioned how BAGSC members had come weekly to paint The Huntington Collection. Ted also mentioned the upcoming ASBA “Out of the Woods” art show at the Brody Center (May 18, 2018 to August 27, 2018) and was most complimentary about the BAGSC paintings. Olga Ryabtsova (L) and Mitsuko Schultz (R) demonstrate in front of the BAGSC wall of Bonsai Portraits. Photo by Jude Wiesenfeld, © 2018. It was also wonderful to see many BAGSC members attending the event. A few additional BAGSC demonstrators or BAGSC members who could answer questions would have been appreciated. Don’t be shy — all levels of expertise are appreciated at our outreach events, and seasoned BAGSC participants are always on hand to lend a hand. Jude Wiesenfeld with her painting Juniperus californica, © 2018. Photo by Mitsuko Schultz, © 2018. 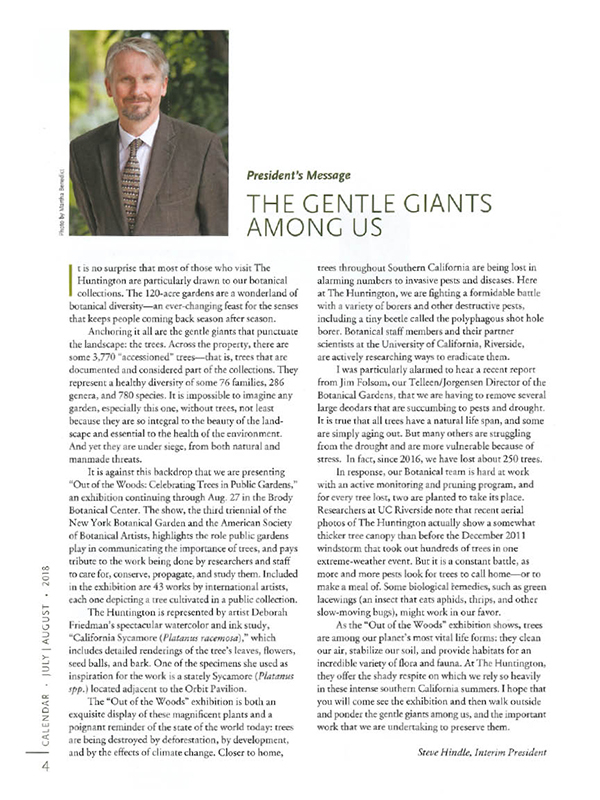 Thank you to Ted Matson and The Huntington for this wonderful opportunity; and kudos to all BAGSC papticipants!